Best-Rite's Rubber-Tak Recycled Rubber Board with Aluminum Trim is so durable that it comes backed by a 50-year warranty. This board features a recycled rubber tackable surface that resists most chemicals and stain- and odor-causing microbes. It is easy to wipe clean and even helps absorb sound in your classroom. Choose from several rubber colors to match your décor. Features an attractive anodized aluminum frame. 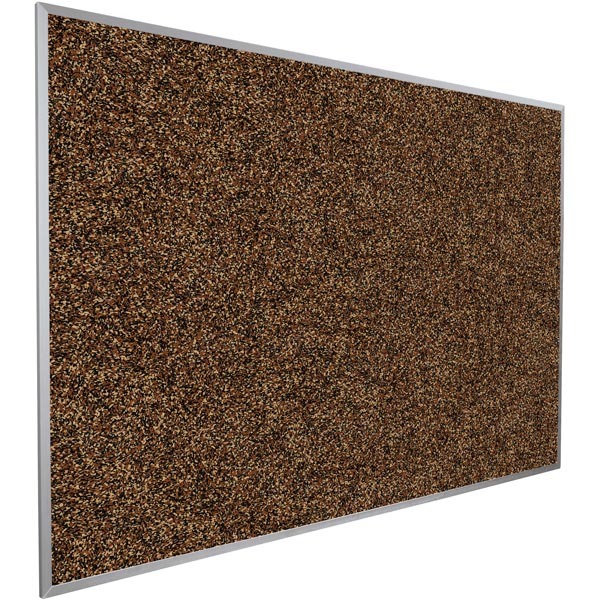 Best-Rite's 18"H x 24"W Rubber-Tak Recycled Rubber Bulletin Board with Aluminum Trim is TAA compliant GREENGUARD certified. Best-Rite's Rubber-Tak Recycled Rubber Board with Aluminum Trim is so durable that it comes backed by a 50-year warranty. This board features a recycled rubber tackable surface that resists most chemicals and stain- and odor-causing microbes. It is easy to wipe clean and even helps absorb sound in your classroom. Choose from several rubber colors to match your décor. Features an attractive anodized aluminum frame. Best-Rite's 2'H x 3'W Rubber-Tak Recycled Rubber Bulletin Board with Aluminum Trim is TAA compliant GREENGUARD certified. Best-Rite's Rubber-Tak Recycled Rubber Board with Aluminum Trim is so durable that it comes backed by a 50-year warranty. This board features a recycled rubber tackable surface that resists most chemicals and stain- and odor-causing microbes. It is easy to wipe clean and even helps absorb sound in your classroom. Choose from several rubber colors to match your décor. Features an attractive anodized aluminum frame. Best-Rite's 2' 9 3/4"H x 4'W Rubber-Tak Recycled Rubber Bulletin Board with Aluminum Trim is TAA compliant GREENGUARD certified. Best-Rite's Rubber-Tak Recycled Rubber Board with Aluminum Trim is so durable that it comes backed by a 50-year warranty. This board features a recycled rubber tackable surface that resists most chemicals and stain- and odor-causing microbes. It is easy to wipe clean and even helps absorb sound in your classroom. Choose from several rubber colors to match your décor. Features an attractive anodized aluminum frame. Best-Rite's 3'H x 5'W Rubber-Tak Recycled Rubber Bulletin Board with Aluminum Trim is TAA compliant GREENGUARD certified. Best-Rite's Rubber-Tak Recycled Rubber Board with Aluminum Trim is so durable that it comes backed by a 50-year warranty. This board features a recycled rubber tackable surface that resists most chemicals and stain- and odor-causing microbes. It is easy to wipe clean and even helps absorb sound in your classroom. Choose from several rubber colors to match your décor. Features an attractive anodized aluminum frame. Best-Rite's 4'H x 4'W Rubber-Tak Recycled Rubber Bulletin Board with Aluminum Trim is TAA compliant GREENGUARD certified. Best-Rite's Rubber-Tak Recycled Rubber Board with Aluminum Trim is so durable that it comes backed by a 50-year warranty. This board features a recycled rubber tackable surface that resists most chemicals and stain- and odor-causing microbes. It is easy to wipe clean and even helps absorb sound in your classroom. Choose from several rubber colors to match your décor. Features an attractive anodized aluminum frame. Best-Rite's 4'H x 5'W Rubber-Tak Recycled Rubber Bulletin Board with Aluminum Trim is TAA compliant GREENGUARD certified. Best-Rite's Rubber-Tak Recycled Rubber Board with Aluminum Trim is so durable that it comes backed by a 50-year warranty. This board features a recycled rubber tackable surface that resists most chemicals and stain- and odor-causing microbes. It is easy to wipe clean and even helps absorb sound in your classroom. Choose from several rubber colors to match your décor. Features an attractive anodized aluminum frame. Best-Rite's 4'H x 6'W Rubber-Tak Recycled Rubber Bulletin Board with Aluminum Trim is TAA compliant GREENGUARD certified. Best-Rite's Rubber-Tak Recycled Rubber Board with Aluminum Trim is so durable that it comes backed by a 50-year warranty. This board features a recycled rubber tackable surface that resists most chemicals and stain- and odor-causing microbes. It is easy to wipe clean and even helps absorb sound in your classroom. Choose from several rubber colors to match your décor. Features an attractive anodized aluminum frame. Best-Rite's 4'H x 8'W Rubber-Tak Recycled Rubber Bulletin Board with Aluminum Trim is TAA compliant GREENGUARD certified. Best-Rite's Rubber-Tak Recycled Rubber Board with Aluminum Trim is so durable that it comes backed by a 50-year warranty. This board features a recycled rubber tackable surface that resists most chemicals and stain- and odor-causing microbes. It is easy to wipe clean and even helps absorb sound in your classroom. Choose from several rubber colors to match your décor. Features an attractive anodized aluminum frame. Best-Rite's 4'H x 10'W Rubber-Tak Recycled Rubber Bulletin Board with Aluminum Trim is TAA compliant GREENGUARD certified. Best-Rite's Rubber-Tak Recycled Rubber Board with Aluminum Trim is so durable that it comes backed by a 50-year warranty. This board features a recycled rubber tackable surface that resists most chemicals and stain- and odor-causing microbes. It is easy to wipe clean and even helps absorb sound in your classroom. Choose from several rubber colors to match your décor. Features an attractive anodized aluminum frame. Best-Rite's 4'H x 12'W Rubber-Tak Recycled Rubber Bulletin Board with Aluminum Trim is TAA compliant GREENGUARD certified. So durable that it is backed by a 50-year warranty, MooreCo's Rubber-Tak Recycled Rubber Board with Aluminum Trim is a great choice for any facility. This board features a recycled rubber tackable surface that resists most chemicals and stain- and odor-causing microbes. It is easy to wipe clean and even helps absorb sound in your classroom. Choose from several rubber colors to match your d�cor. Features an attractive anodized aluminum frame. MooreCo's Rubber-Tak Recycled Rubber Bulletin Board with Aluminum Trim is TAA compliant GREENGUARD certified. Call (877) 839-3330 for assistance with a quote or order. It is also safe, fast and easy to order online.